Around the wider world of golf: Jennifer Kupcho won the inaugural Augusta National Women's Amateur; Jin Young Ko got her first major at the LPGA's ANA Inspiration; Daan Huizing made golfing history by becoming the first player to win the Jordan Mixed Open, a full-field mixed professional tournament on the ET/LET (yes, that means men and women playing against each other in the same event, and Meghan MacLaren finished runner-up); Leona Maguire won the Windsor Golf Classic on the Symetra Tour; Jun-Won Park won the Novil Cup on the Japan Golf Tour; and Sadom Kaewkanjana won the Bangabandhu Cup Golf Open on the Asian Tour. Tuesday Twofer picks are definitely NOT going according to plan. I picked Aaron Baddeley (T30) to win and Abraham Ancer (T42) to Top10. After the first day or so I thought I might have done better this week but alas, it was not to be. Maybe I'll do better at the Masters this week. Corey Conners probably doesn't care how I did with my Twofer Tuesday picks. After all, he finally snagged his first Tour win. He had a near miss last October at the Sanderson Farms Championship. But Sunday must have been a real test of nerves. Check out his scorecard: He birdied four of his first five holes, then bogeyed the next four, and finished with six birdies on the back nine. His poor wife Malory looked like she was dying by the time he reached the 18th green! When she leapt into his arms after he holed out, she asked him if this was real. Corey better get used to it being real, and get used to it quick. He needs to get to Augusta today, since he snagged the final spot in the Masters field with his win. 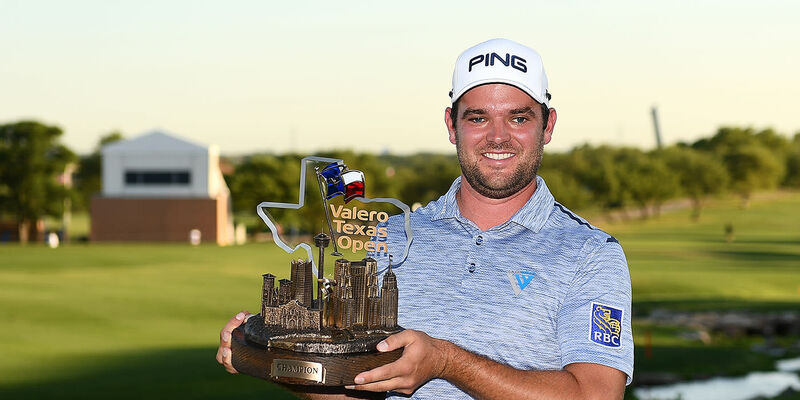 He no longer has to Monday qualify for events -- he Monday-qualified for Valero, in case you didn't know -- and he's locked up his Tour card for a couple of years or so. And he qualified for a bunch of key events. Of course, he also picked up his first Limerick Summary, but it may take him a while before he realizes that. It's a big honor to process, after all. His wife’s nerves were falling apart.